Yet another hotel may be coming to Sunset Boulevard with a proposal by Mani Brothers to convert the historic Piazza del Sol on Sunset Boulevard from an office building to a hotel. That proposal will be reviewed on Monday by the West Hollywood Historic Preservation Commission before it is presented to the city Planning Commission. The building, which sits on the northeast corner of Sunset and Queens Road, was constructed in 1927 as an apartment building named the Hacienda Arms Apartments. It later was renamed the Coronet Apartments. After suffering a fire in 1983, it was converted into an office building. 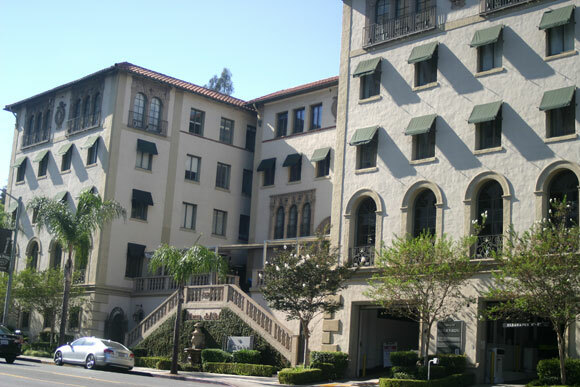 At that time, the building owners entered into a still-standing agreement with the Los Angeles Conservancy that gives the conservancy the power to monitor changes to the building and its façade. The four-story building contains 56,000 square feet of commercial space. A rear parcel of land is the site of a four-level parking garage, most of which is located within the boundaries of the City of Los Angeles. The proposed hotel would contain 34 rooms and two restaurants open to both hotel guests and the public. It also would feature a new lounge and pool deck on the rooftop. The building already houses on the first floor the well-known Katana restaurant, which is expected to remain in place. A second restaurant would be added on the fourth floor. It would include a lounge where live musical performances would take place. The building owner is asking the city to grant some exceptions to current development standards, arguing that they are necessary in order to make the rehabilitation of the Piazza del Sol building physically and financially feasible. One of the exceptions would allow the developer to add almost 10 feet to the height of the building to accommodate the rooftop lounge and pool deck and an elevator shaft. Another would exempt the developer from having to install public art valued at at least 1% of the cost of the project or pay an in-lieu fee to the city. The developer argues that the restoration of the building’s classic façade is, in effect, a arts contribution. The Commission will meet at 7 p.m. on Monday, Oct. 22, in rooms 5 and 6 in the Plummer Park Community Center at 7377 Santa Monica Blvd. Free parking is available in the lot in front of the center.